The name George Foreman brings infomercials and the lean, mean grilling machine known as the George Foreman Grill to mind for much of today’s society. However, the former Heavyweight Champion was one of the most feared competitors in the ring and had one of the most interesting careers the world of boxing has ever seen. With a career total of 81 professional bouts, Foreman retired with 76 wins with 68 of them being by knockout and only suffered five defeats during a 28-year career. George Foreman was born to JD and Nancy Foreman in the town of Marshall, Texas, in January of 1949. By the age of 15, George found himself as a street brawler in the streets of Houston’s 5th Ward where he lived off cheap bottles of wine and seemed to have no bright future ahead. His luck and outlook seemed to change after catching an athletic hero on TV promoting Lynden Johnson’s Job Corps program which allowed individuals like Foreman to have a second chance at a successful future. Wasting no time to change his luck, George was on his way to California where he met Program Councilor and boxing coach, Doc Broaddus, who motivated Foreman to become a fighter by using the ring as his outlet appose to his ways as a street brawler. Soon after he began training, Foreman built an impressive amateur record which became publicly noticed during the 1968 Olympics in Mexico City where the Texas native won a gold medal in what was only his 25th amateur fight. One year later, George made his transition into a professional and within two years became a Number 1 contender; as he was the top ranked challenger. By 1972, George Foreman had an impressive 37-0 record with a majority of his wins coming by knockout. On January 22nd, 1973, Foreman got his first title shot taking on then-champion, Joe Frazier, in Kingston, Jamaica. Going into the fight Frazier was heavily favored, but the heavy hitting challenger knocked out the champ in the second round, sending him to the canvas and winning the Heavyweight Title for the first time in his career. Foreman went on to successfully defend his title twice before losing it in one of the most memorable fights in boxing history when he took on Muhammad Ali in the Rumble in the Jungle; which took place in Kinshasa, Zaire. Many in the boxing world speculated that the loss to Ali had affected Foreman and had maybe put an end to his short career as he took all of 1975 off from the sport until his return in 1976. After a string of victories, Foreman would again lose, this time to Jimmy Young in 1977, which would be his last fight for an entire decade. Following his loss to Jimmy Young, Foreman states that he had a religious experience in his dressing room. This experience is what led to his then-retirement from the sport as he followed his faith and was ordained a Minister; preaching in his hometown of Houston, Texas. After years of preaching, George founded the George Foreman Youth and Community Center and opened its doors in 1984. The center was created and funded through money Foreman had saved throughout his retirement and his earnings from his boxing career. The intentions of the Youth Center would be to provide troubled unguided youth the chance to be a part of a larger family and find guidance and positivity through their peers and counselors at the center; much like Foreman did at the age of 15. Heavily influenced by the Job Corps, the George Foreman Youth and Community Center gave children the choice of joining and was in no way religious based or biased. Through various supportive programs and initiatives, George’s Youth Center allowed the opportunity for new exposure and a broad outlook on what can be accomplished with hard work and determination. Though the Youth Center was assisting numerous children and young adults, funds began to run dry by 1987 because as documented, Foreman had been funding the project through his own financial estate. Showing hints of the true fighter he was, George was not willing to look or ask for assistance and elected to continue to fund his project in efforts to stay operational. With support and love from those within the Youth Center, Foreman returned to the ring in 1987 at the age of 38. 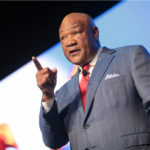 With many high risks involved with his comeback, Foreman seemed to pick up where he left off 10 years prior as he re-entered the boxing world with a string of victories and a new positive image. Foreman would gain the right to a title shot in 1991, but lost to Evander Holyfield in a bout that not many critics gave Foreman a chance to win. However, George would again have a shot at the title he lost to Muhammad Ali in Kinshasa, Zaire, as he fought Michael Moorer for the Heavyweight Title. At age 45, Foreman became the oldest fighter to ever win the Heavyweight Title, winning it 20 years after his loss to Ali. Foreman would continue to fight and financially support his Youth Center, not only through his financial gains from boxing, but with the additions of his outside business ventures such as the George Foreman Grill. George would fight for the last time at age 48, in a loss to Shannon Briggs, bringing an end to a career that was spawned by a simple commercial seen by a young George Foreman 31 years prior. He was given a second chance to create a bright future for himself, something he continues to give today’s troubled and unguided youth.